In an ideal world, every boat owner keeps his boat or yacht behind his house. When it comes to boat storage, every boat owner prefers this scenario. But for a number of reasons (waterfront real estate is expensive, some boats are too big, the water might not be deep enough, the dock might not be sufficient for the boat, etc. ), many boat owners have to seek alternative boat storage options. Thankfully, boat storage options are plentiful amidst most popular boating destinations. We can typically group the boat storage types in the following categories: at-home or self storage, outdoor storage at a boatyard, slips at a marina and high and dry storage. Self Storage - A simple form of boat storage is storing the boat yourself either at your home or at a self storage facility. For small boats, boat owners often store the boat in a garage, a general purpose storage facility or an outdoor storage place for boats (this can include covered and uncovered storage). Waterfront homes offer the ability to store the boat either in the water adjacent to the home, or on a lift to get the boat out of the water. Lift technology has progressed in recent years, and boat owners have many options should they choose to install a lift on their property. While traditional boat lift options still exist, boat owners can also consider newer platform lifts and lower profile lifts that tend to maintain a cleaner aesthetic against beautiful water views. A general rule of thumb is that lifts will typically cost $1 per pound it needs to lift. As such, a 20,000 pound capacity lift would generally run in the $20,000 range. Also, it’s good practice to overdo the weight capacity slightly. Perhaps if you have a 20,000 boat, consider a lift that is certified up to 25,000 pounds. 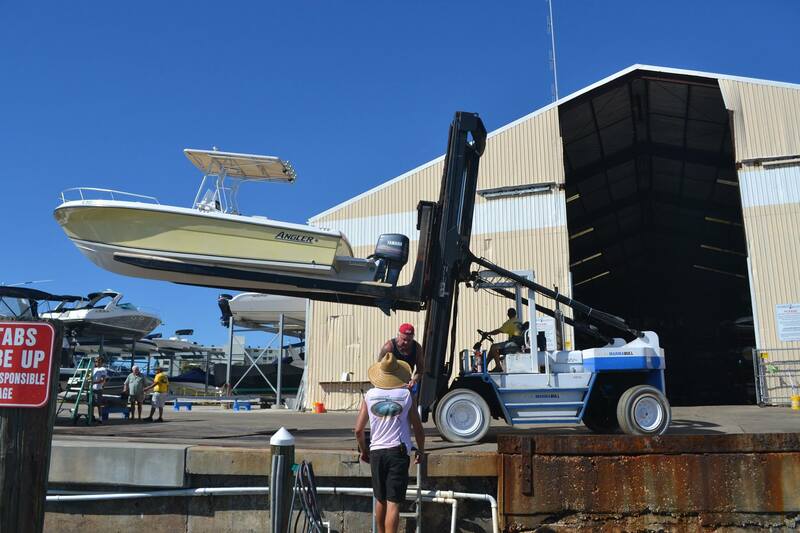 Lifts are typically appropriate for boats in the 15 ft to 60 ft range. Boatyard Storage - This boat storage option is essentially exactly what it sounds like. Boats stored in an outdoor setting in a boatyard. Boatyards are typically located near water or other marinas, but offer a less expensive option compared to a marina or high and dry storage. Some boatyard options are attached to marinas as well. Marina Slips - Many marinas offer multiple boat storage options. Wet slips at marinas are typically the least expensive option as the boat simply sits in the water at the marina. Lift slips are also typically available and give the boat owner the option to have the boat out of the water. With the boat out of the water, boat owners will not have to clean the bottom of the boat as much. However, the boat is still susceptible to other environmental effects such as sun exposure and rain or hail. Note that some marinas offer covered lift slips. The advantage of wet slips and lift slips over high and dry storage is that you aren’t beholden to staff to give you access to the boat. You can access the slip on your own, hop in your boat and be out on the water in minutes. Like high and dry storage, having your boat stored at the marina means not having to trailer your boat. High and Dry Storage - Many marinas also offer high and dry storage. High and dry storage means that your boat is stored indoors up on a rack with other boats. 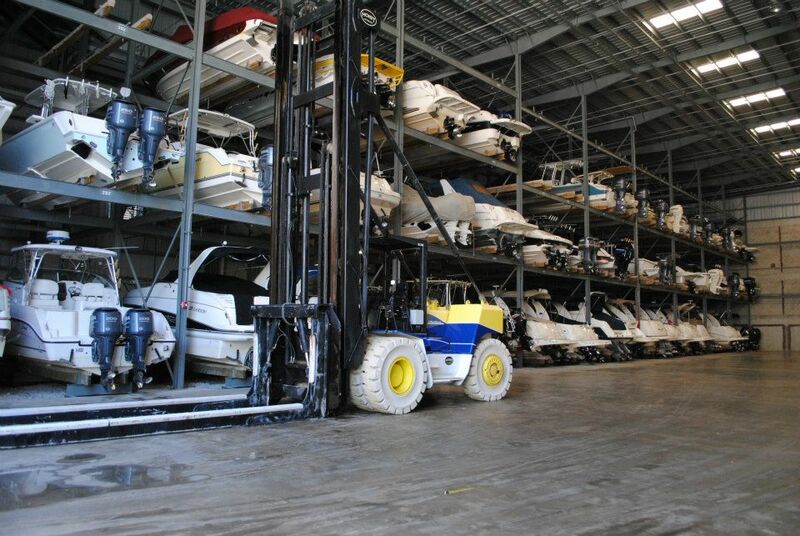 The facility will utilize forklifts to lift and lower boats in the storage area. Storing your boat in an indoor environment is the best possible setting for your boat. High and dry storage, however, does come with a few drawbacks. First, high and dry storage facilities do not offer power for stored boats (whereas many lifts will have an option to plugin and keep your batteries charged). Depending on your boat and complexity of onboard systems, there are many systems that can drain the battery system during storage. Secondly, the constant use of forklifts can generate significant dust and soot inside the facility that can cover the stored boats. Typically this can be minor and easily hosed off, but if the boat sits for too long, it can get quite dirty. Keeping the boat covered during long-term storage can be a good idea to manage this issue. Rack storage availability will be based on the beam of the boat, the length of the boat, the weight of the boat and the height of the boat (many owners forget to consider the height!). Many high and dry storage facilities will let you call ahead to have your boat brought out of storage, prepared for use and in the water waiting for your arrival. Many will even stock your boat with ice. It’s good practice to get to know the attendants and be generous with tips. Upon returning from use, you can typically leave the boat in the water and hand over the keys. The attendants will wash the boat, flush the engines and place the boat back in storage. Have a critical eye when driving up to the marina or storage facility. Is the area clean and landscaped? How professional are the staff and management? What are the security procedures of the facility? Is the property gated? Are security cameras present? Ask about any potential recent security issues. What are the steps and procedures in the event of a serious storm or hurricane? Should the facility enter the path of a NOAA hurricane forecast, what are the procedures in place? If utilizing high and dry storage, is it possible to have the boat cleaned from time to time? What amenities are available for slips (electrical, cable TV, wifi access, etc.)? Are the personnel insured and bonded? Preparing the vessel for storage is an important process. By taking the appropriate measures before storage, you can more easily ensure your boat or yacht is as close to seaworthy as possible upon your return. Make sure the boat is washed thoroughly before storing the boat. Remove any perishables from the boat. Drain the bilge, and discuss with the marina personnel if there are any restrictions pertaining to how much fuel is left in the tanks (especially for long-term storage). For boaters up north, winterizing is a topic that commands more attention than we will give it in this article, but it’s worth mentioning at a high level. When the boating season winds down up north, there are crucial considerations such as whether to remove your boat from the water, winterizing the vessel and its various systems and finally where to store the boat. For some, this means indoor, climate-controlled storage (also the more expensive option). For others, it means going through a full process to protect the boat being stored outside. Shrink wrapping, winterizing the engine, taking care of the fuel and battery systems and more are all considerations that must be made. If you’re a new boat owner, it’s best to lean on a professional to ensure your boat is properly cared for as you approach the winter season. Additionally, many boat owners use their boat as a vacation destination unto itself (a floating condominium, if you will). For instance, in Florida, many residents that live inland, in say Central Florida, keep a boat or a yacht at a marina on the coast year round, and then travel to the coast and stay on their boat for a few days. In other situations, some folks will enter retirement and spend the first few years of this new phase of life living on a boat. For these boat owners, the marina slip is often a popular boat storage choice. The boat is accessible and ready for use at any time. Many marinas also offer social opportunities and amenities such as bars, restaurants, exercise facilities and more that are within walking distance of your boat. If this describes your boating lifestyle, be sure to discuss how you plan to use and stay on the boat before signing a boat storage contract with a particular marina. Depending on how full-time or part-time your living on your boat or yacht, many marinas will charge a “liveaboard fee” that is on top of the usual slip rates. With the liveaboard option becoming increasingly popular in recent years, some marinas will even market themselves as liveaboard marinas. For instance, Regatta Pointe in Palmetto, FL, presents itself as “Florida’s Premier Live Aboard & Large Boat Marina.” To accommodate such boaters, the marina offers multiple clubhouses, showers, an exercise facility, wireless internet, a pool, laundry services, restaurants and other businesses. Other marinas like St. Petersburg’s Municipal Marina don’t necessarily advertise themselves as a liveaboard marina, but have naturally developed a very active liveaboard community (complete with a multi-year waiting list!). This isn’t completely unusual, so depending on your area or region, be sure to research all the options. Note, at the bottom of this article, we have a variety of marina options located around Florida as a starting point for your search. Can you bring an outside crew to clean or work on the boat? The answer is typically no on this due to the storage facility’s own liability protection, but be sure to ask this question before signing a contract. Light cleaning and simple maintenance work on your own is usually fine. If you have a boat in high and dry storage, how long does it take to launch? Most facilities will communicate a standard wait time, but during busy seasons, this can vary widely. It’s best to give the facility sufficient lead time before arrival, or better yet, schedule it a day or two ahead. What is required if I decide the facility is the right option for boat storage? In most situations, proof of insurance is required. Contract terms such as security deposit, first month’s payment, last month’s payment can vary depending on the facility. What are the measurements a marina will use to determine length, height? Typically the length includes engines, swim platforms and bow pulpits. Beam and height overall are calculated from the keel to the highest point. What types of contracts are available from a marina or a storage facility? Marinas and storage facilities will often offer a range of contract options. While month-to-month and seasonal options are usually available, discounts can often be had for longer commitments such as annual. Marker 1 Marina, Dunedin, Florida. Dry and wet storage accommodations. Unlimited launch and retrieval. 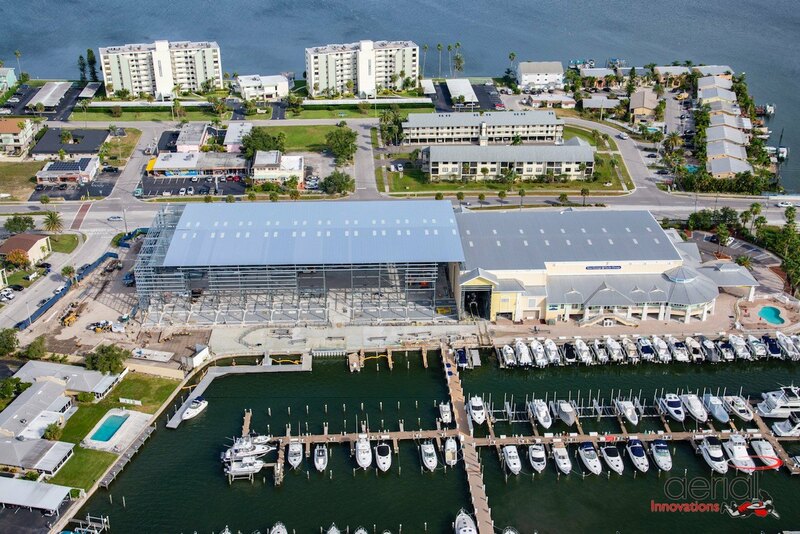 Marker 1 Marina has recently undergone a major expansion. Gulfport Municipal Marina, Gulfport, Florida. Wet slips and dry stack storage, two fueling stations. Hidden Harbor Marina, Sarasota, Florida. Indoor/Outdoor dry storage. Concierge service. Rose Marina, Marco Island, Florida. cat5 Hurricane rated. Transient to annual contracts. A full-service marina. Legacy Harbor Marina, Ft. Myers, Florida. 131 Slips up to 141’. Every convenience is available. Glades Boat Storage, serving Ft. Myers, Florida and other ports. All size boats accepted. Haul-outs, blocking and diverse services provided. Municipal Marina. St. Petersburg Florida. 640 wet slips. Liveaboard options available. Regatta Pointe Marina, St. Petersburg Florida. 350 slips for yachts up to 120’. The marina offers a resort lifestyle. DOCKWA: This website catalogs a wide range of marinas across the country. The site lists all pertinent information such as address, phone number, amenities, and website link. Put your destination in the search box and let DOCKWA present you with options. Sparefoot: This site aggregates a considerable number of storage links. Everything from self-storage, car/RV and boat storage. Put in a zip code and the site will come back with a healthy number of options for further research. This site is not the place for finding a spot to put a larger yacht. Marinas.com: Light on graphics and sophistication, the site has a decent listing of marinas and harbors. Worth a look. Safe Harbor Marinas: Safe Harbor is the largest owner and operator of marinas in the world. Membership will have its privilege with this website. Tom George Yacht Group is here to guide you on every step of your boating journey. Should you need advice on how and where to store your boat, let us know. Our team of yacht brokers and salespeople are familiar with all major boating destinations around the state of Florida.